Clay Carroll turned 70 last week. In other relentless-march-of-time news, my back hurts. I’ve got a heating pad on it right now, as I did yesterday and the day before, plus I’m popping Advil, which is about as close as I’ll get these days to being able to relate to the section I’m currently reading in Life, Keith Richards’ biography, in which he says, referring to his heyday, “I used drugs like gears.” I nod knowingly, washing down my Advil with tap water and reading on about John Lennon puking in Keith Richards’ bathroom after mixing smack with wine (the bespectacled Beatle was a lightweight, in his host’s estimation). Keith Richards isn’t seventy quite yet, but he’s closing in on it. My mom just turned seventy last month and is plowing along like she could fill in for Ron Wood for a few tour dates if the Stones needed her to. I tried calling her pretty early this past Mother’s Day and she was already out working in the community garden near her house. She called me back a little later, but I was in the grocery store, so she said, “I’m going back out there again right now for the rest of the morning but try calling me around lunchtime.” I did, and she told me, among other things, that she has recently learned how to clog-dance. Clay Carroll, Clay Kirby, Ken Clay. By extension, Ken Brett, a little. For a while, when life is just getting started, things all kind of blur together into one big related mess. I went to Wrigley Field later in the day on Mother’s Day after calling my mom and popping some more Advil for my old-guy lower back, and there were a lot of mothers there and a lot of little kids, too, the game to them more of an exciting kaleidoscope than it was to me, who snapped most to the upper limits of my lukewarm attention whenever Jay Bruce came to bat because he happens to be on my fantasy baseball team. I’m saying it’s sort of fun when Clay Carroll and Clay Kirby and Ken Clay are all the same guy. 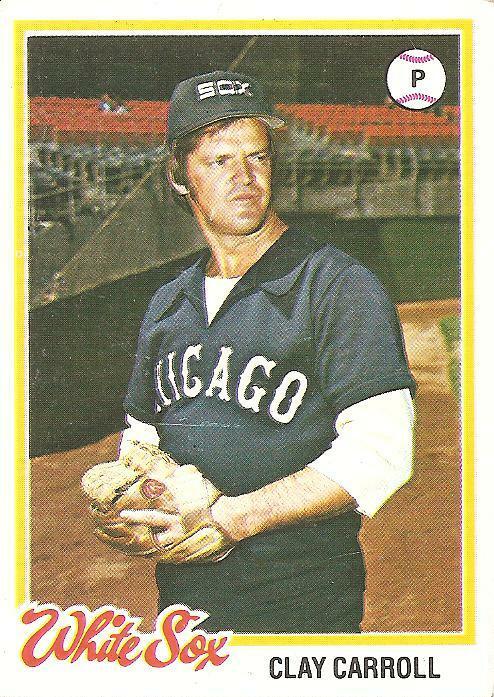 Eventually, I figured out that Clay Carroll was a distinct individual, and in fact one of the premier bullpen guys in the National League for a while, and on top of that one of the great subjects of a baseball card, namely this one, the gnarled Southern veteran jammed inside the ludicrous Ye Olde Tyme Taverne garb of the Veeck-as-in-wreck 1970s White Sox. There’s something about the photo that makes it clear that, ridiculous as he looks in his giant lapels, Clay Carroll would be tough to face. He seems like someone who started drinking backwoods moonshine and killing wildlife with a crossbow at the same age when I was still blissfully unaware of the distinct differences between Clay Carroll, Ken Clay, and Clay Kirby (and Ken Brett, a little). I have good feelings about the days when my life was a kaleidoscope. At the end of my phone call with my mother, I tried to tell her how great she was as a mother, bracing myself for the inevitable argument. “Oh, god, I was terrible,” my mother said before I was even done with the first sentence. I can never quite get across what I’m trying to say during these disagreements in which my position is that my mother was a good mother and my mother’s position is roughly that it’s a wonder my brother and I did not end up by our junior high days hooked on airplane glue or shifting for ourselves in a hobo shantytown down by the railyard. Lately I feel more compelled than ever to say that I felt taken care of and safe and loved because, bad back and all, I’m a few weeks away from becoming a parent, if all keeps going okay. Such a thing has made me start thinking about my own parents and how things were from their perspective. It seems like a difficult, daunting thing to have a kid to take care of. For example, I just sneezed while writing the previous sentence and a jolting pain went through my back. How am I going to be a father with a back like this? Do I start mainlining Advil? What would Keith Richards do? Leaning down made my back hurt. You are currently browsing the archives for the Clay Carroll category.